My Nepal scrapbooking layout ran into a problem; I've never been to Nepal, and the only place I'd ever go mountaineering in is Holland. 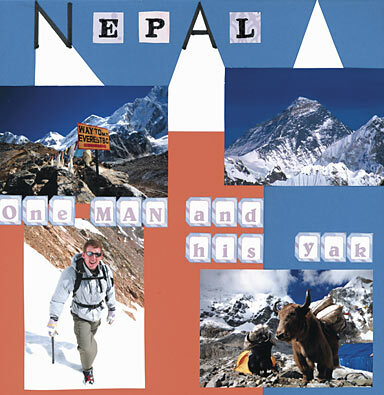 Enter my Nepal scrapbooking layout 'body double'...(the guy, not the yak). Now this layout has finally found its niche on this site, it looks like a big fat pencil running up the middle of it. Never saw that before. I love the crisp colours of snow-covered peaks and a cloudless sky. I have been skiing - I lied about Holland. But my motto is "if it's too steep for skiing on - don't be on it at all"
I picked up some lettering for my Nepal scrapbooking layout from Sassafras Lass, and used cardstock from Bazzill Basics. I used the sharp triangular white peaks as an embellishment of my title. They look like those mountains that kids always draw. Now they ARE steep! A SKETCH TEMPLATE AS YOUR SHERPA! I would have really liked to have got hold of Jen Gormley's '500 Scrapbooking Sketches' BEFORE launching into this layout, because I might have achieved more in less time. She has a knack of bringing simple line drawn sketches to life and you can see a good example if you scroll about half way down this page . I couldn't locate 'yak' brown in my cardstock so I offset the cold starkness of the blue and white with the colour of freshly-poured hot chocolate. I dabbled with the idea of going for bright orange - as evident on the 'way to Everest' sign and on the 'high-visibility jacket that one of the yaks seems to be wearing. HOW ABOUT USING 'CRICUT' FOR YOUR NEPAL SCRAPBOOK LAYOUT? i) Although Cricut doesn't require a computer to use, the DS manual does seem to assume more technical knowledge than it might. That can be frustrating for us 'technophobes'. ii) You can burn through a lot of cardstock while you're 'trial and erroring'! (iii) Lack of really helpful video tutorial support. I had to search around the web. Fortunately Brandi Gore, a very experienced Scrapbooker has put together THE manual for using the Design Studio Software both for Cricut and for Cricut Expression - the manual that many people think should have come with the DS in the first place. Get yourself a copy and save yourself a pile of frustration! I'm not talking about the 'one man and his yak' concept, you'll be relieved to hear. I mean that just because you haven't been to Nepal doesn't mean you can't attempt a Nepal Scrapbook, or at least a layout. If no one you know has been there either, then use a body double. My guy didn't charge!